Meteorologist Drew Tuma has your Bay Area AccuWeather forecast. Clear skies and mild temps overnight in the low 50s to low 60s. 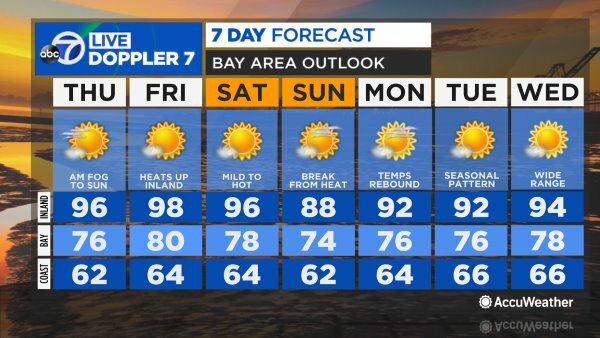 Wednesday is another warm day across the Bay Area. VIDEO: Meteorologist Drew Tuma has your Bay Area AccuWeather forecast. What you will notice in the afternoon is a sea breeze kicking in which will keep the coast cool and temperatures everywhere else a few degrees cooler than Tuesday. Under sunny skies, highs range from the low 60s to low 90s. A cooling trend gets underway as fog returns in the morning to the region. In the afternoon under sunny skies, highs range from the low 60s to mid-80s. SHARE YOUR PHOTOS: Show us the weather where you live by tagging your posts, video, and photos #ABC7Now. We may use them on our site, app, social pages, or on TV!